Despite the team being unable to clinch their biggest goal of the season with overall victory in the Tour -Nairo Quintana finishing in 3rd place, with Ion Izagirre saving an otherwise middling performance with his stage win in Morzine-, the year was one of the best in their history for the Blues. 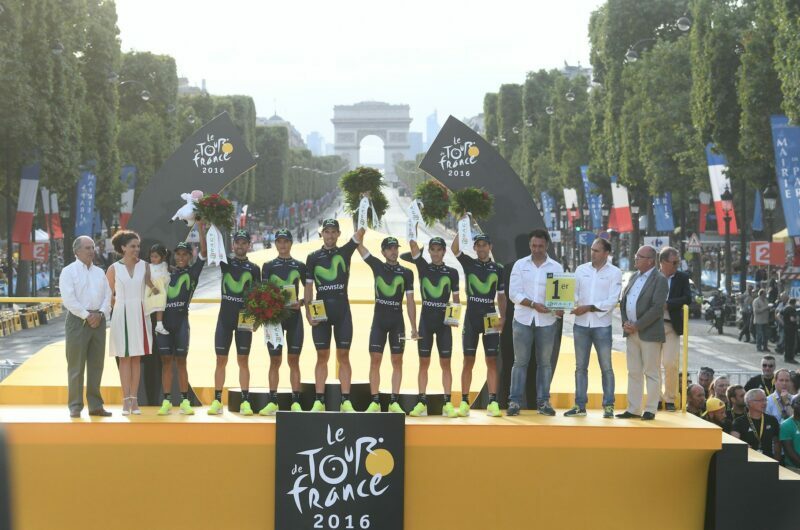 The Movistar Team obtained their fourth consecutive UCI WorldTour title; completed their most successful season in terms of victories (36, tied with Banesto ’98, conquered by 14 different riders); a Grand Tour, the fourteenth for Unzué’s lads, thanks to Nairo himself in the Vuelta; and success in prestigious races like the Flèche Wallonne (Valverde), Romandie, Catalunya (Nairo) or even a European TT title, the first ever such contest, by Jonathan Castroviejo, who also claimed bronze in the Qatar TT Worlds despite spending four months off early in the season due to a neck fracture. Telefónica adds another three years to their partnership agreement in September, weeks before Pablo Lastras gets back to the team as staff member. The team works hard for Nairo Quintana during the Vuelta a España, which the Colombian ultimately won. Nairo Quintana on top of the Vuelta a España podium in Madrid, ahead of Froome and Chaves. Second consecutive victory in the Tour de France team GC for the Blues. Valverde wins his fourth Flèche Wallonne. Izagirre, Castroviejo and Valverde claim yet another 1-2-3 in the Spanish Nationals’ TT. Nairo Quintana completed a fantastic 2016 season, with overall victories in WorldTour events like the Tour de Romandie. Jonathan Castroviejo became the first ever European champion in the individual time trial event for pros. Carlos Betancur started his resurgence as a professional rider with a victory in the Vuelta a Castilla y León.